There is no denying that partners can make or break your day in EMS. I have had hard days eased by good partners. I have argued with partners and become life long friends with other partners. I have been working as a line paramedic again and frequently hear my advice I gave to others as a EMS Lieutenant, “You don’t have to be friends, just do the job and get through the day.” I thought it would help many of you to discuss the problems and strategies dealing with partners. What are the issues that cause problems? I have found that exhaustion, seniority, personal issues contribute to partner problems. Being tired is a frequent problem in our line of work considering shift work and overtime. It is important to realize you are tired and be cautious not to instigate problems with your partner. I use the strategies of getting out of the ambulance, taking a walk and sticking to the work when dealing with bad partners. I have found that being rested and flexible can help deal with partners. Sometimes it is necessary to be business like and not “take the bait” with partners that are antagonistic or controlling. It is far easier to engage in negative behavior when your partner tries your patience. How do I deal with patient care issues? When it comes to patient care, do the right thing. I have always said, “Doing the right thing is not always easy, but it is always the right thing for the patient.” I have found that by doing the right thing, the right way creates a little stress initially but makes for a good career in the grand scheme of things. People who do not want to do the right thing will find other people to work with and those who do the right thing will seek you out. What problems do you have with partners? How do you deal with partners? I can remember being a new EMT and having to deal with partners that had seen and done it all. Partners who had no tolerance for “rookies” and our mistakes. When you are lucky enough to have a senior partner who wants to teach you, be grateful and listen to their suggestions. Let’s talk about dealing with “burnout” in your partners. Burned out EMTs and paramedics are common in EMS because of the nature of or job, the hours we keep and the stresses we must endure. Burnout is a condition where a provider has nothing more to give, does not have interest in doing the job and is usually very negative. Personally I think burnout is the path of “doing nothing” to preserving your career and motivation. EMS providers should lead a balanced life managing, stress, diet, exercise and personal issues. We can avoid burnout by leading a balanced life. Recreation is important for time away from work. Diet, exercise and relaxation are important to the life of EMTs and medics. I have always found that pursuing college, reading books that interest and taking weekend trips help me relax and balance the stress of EMS. The worst feeling is to feel tired and “stuck” in our life. I once worked with a burned out medic named Richie. Before I was picked up by Richie at my station I was warned by an old timer, “Boy, just go home sick, do yourself a favor. Nobody wants to work with Richie.” Being new I did not want to go home sick or find an excuse not to work. ”How bad can it be?” I thought, we only have 6 hours together.” Richie picked me up and we drove out of the station. When we returned in the morning I was pleased to see the reaction on the dinosaurs face as Richie opened the door and thanked me for a ‘fun” night. It turned out that Richie and I had two common interests off the job, basketball and pursuing a college degree. We talked about what classes to take and what direction to head in our careers. I also asked Richie about some of his experiences in the South Bronx, he had worked the same unit for 18 years in the South. We both had a good night and I felt like I had actually helped him. Remember they are burned on the job, as a person they have experience to offer. Next time we will talk about why you should help train the newbie’s even though “it is not your job”. Today is a proud day personally. I started the NYC EMS Academy 28 years ago today! 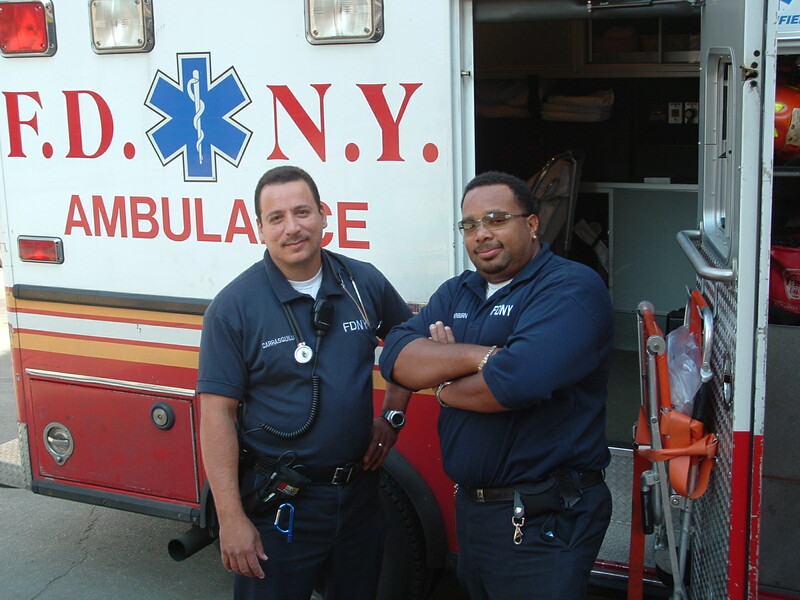 Although I am retired now from the FDNY I am very proud of my start in EMS. Looking back at my career it is interesting where my bosses and partners have ended up. Some higher, some happier. How do you deal with difficult partners? Please leave your comments below. by Judith Wyatt and Chauncey Hare. Copyright 1988, 2008. Thirty years ago people thought sexual abuse rarely happened and physical abuse of children was normal. Fifty years ago no one thought of treating a family. Today physical and sexual abuse of children is against the law and treatment of dysfunctional families has become commonplace. Mental health professionals have been moving deeper into the arena of social issues. Spouse battering and substance abuse are also no longer private problems, but mental health conditions treated by public education as well as therapy. In the growing concern over child and spouse abuse, and the horror at how widespread it continues to be, we are uncovering a picture of generations of families locked into abusive behavior. We talk of breaking the cycle, but new cases keep appearing; abusers keep abusing. Alice Miller writes a new book each year encouraging parents, the press, and mental health professionals to face the abuse they themselves suffered as children in the past, so they can stop their continuing denial about the seriousness of child abuse in the present. We believe there is an important overlooked reason why child and spouse abuse continues. We invite you to review with us how unaddressed abuse at work contributes to continuing abuse at home. Child and spouse abuse will persist as long as we fail to confront work abuse openly. What keeps people locked into abusive behavior in their families? It’s not only due to the abusers being abused years ago as children that they continue to abuse their own children. It’s because these abusers are being abused daily at work, and as yet little is being done to stop it. We need to look carefully at how the daily abuse at work reinforces and continues the abuse that people experienced in childhood. We also need to understand why it’s taken so long to see that abuse at work is a result of people’s early mistreatment as children and that work abuse keeps these patterns alive so they are passed on to the next generation. Every day at work, many Americans are reexperiencing the abuse they grew up with. Most workplaces are abusive systems that run on abusive and unconscious rules. The unconscious rules, or norms, hypnotize employees into obedience and self-deprecation—the same way abusive families hypnotize children to believe that they are at fault. From the systems perspective, it makes scientific sense that most American workplaces can be no healthier than the families of the people who create and maintain them. Eventually, these workplaces must confront and change their norms, just as dysfunctional families must change their unconscious rules if abuse is to cease. It’s an unfortunate fact that most workplaces keep employees functioning in a state of chronic fear and shame, destroying potential and fostering mental and physical symptoms, just like dysfunctional families. As in families with rigid boundaries, they often scapegoat a selected person until he or she breaks down. Our organizational and clinical experience shows scapegoating is more widespread than work organizations care to admit. Scapegoating often happens to employees who were previously the most creative and productive, because the systems norms often require punishing people who question the dysfunctional rules. One psychiatrist colleague of ours called work abuse “the missing link” in the chain of conditions that create and sustain abuse, and denial about abuse, in our society. If it’s so important, why haven’t we heard about work abuse until now? The reason is that the misery of daily work is something we all know about, and take as a given–we even joke about it or say, “Oh, come on, it isn’t really that bad.” Like other forms of abuse that people believe they can’t change, we have to deny it in order to survive it. We can never succeed in stopping child abuse without confronting work abuse openly. As human beings we treat, and will continue to treat, our children as badly as we treat ourselves. If it is “normal” for a person to be demeaned and humiliated by his boss every day, why shouldnít it be “normal” for that person to demean and humiliate his child? It may even seem necessary if he or she believes the child has to learn to endure humiliation in order to survive the work world later on. If dad has to become a block of steel at work just to get through the day, how can he be expected to become soft and caring when he comes home at night? People can’t practice honest and caring behavior when forced to be in denial and uncaring 40 to 60 hours a week. This paper is an invitation to you the reader to assist us with a difficult task–confronting our own denial about the significance of work abuse as a mental health issue. We know that denial is the defense that seals the abuse cycle–whether we are talking about alcohol, sexual abuse, or battering. Denial is what prevents us from seeing the obvious. Work is the drunk we step over in the livingroom and don’t see. It is the reality that many people feel abused and completely out of control at work, that they assume work has to be that way, and that they must numb themselves in order to get up and go there each morning. Beyond sharing in the general denial about abuse at work, mental health professionals may have particular needs to deny the issue. These stem from four sources: 1) how they experience their own work culture in contrast to the rest of the work world; 2) their projection of their own autonomy at work onto the lives of their clients; 3) the systematic abuse they suffer (and later inflict) in their training; 4) the assumed limits of the psychotherapist’s role, and the personal and social risks involved in challenging these limits. Diane was an employee in the personnel department of a large utility company. Her job was reviewing employees’ mental stress claims. She came across our literature and called us for assistance. She was under stress herself and felt alone because her therapist seemingly couldn’t believe that a large utility was treating it’s employees as badly as she and her fellow employees experienced it. We asked Diane to have her therapist call us. In our phone conversation with the therapist, we were ineffective in assisting the therapist to take a family systems view of her client’s situation at work. Unfortunately, she had not had sufficient training or experience with norms in work organizations to enable her to translate her family systems knowledge to her client’s work situation. The therapist was also reluctant to let us see her client. Two months later, Diane called again because she was being scapegoated and was in crisis. The next day she called a third time to say that our help was too late, she had been fired. However, she said she now had her therapist’s permission to come to talk to us about what had happened at work. The work culture of most psychotherapists–that is, the collection of unconscious rules, norms, of how therapists act and what they believe–is unlike the cultures of most workplaces. Therapists, even if practicing in large institutions, exercise a greater degree of autonomy and creativity in their counseling than most people are allowed at work. For the therapists who are self-employed, the difference is even greater. Therapists have extensive control over their actual working conditions, and they have encouragement to take initiative, be assertive and honest in their communications with others. In contrast, most employees experience being watched constantly; they experience their self-expression being denied and their communications being dishonest. Additionally, their work tasks are designed and controlled in detail by their superiors. The relative autonomy of therapists in controlling their work is wonderful for them, and should be available in everyoneís life. But the scientifically measured fact (University of Michigan Institute for Social Research) is that 95% of workplaces are authoritarian and clients must adapt to authoritarian systems. It’s a hard fact of life: it’s presently impossible for the majority of therapists’ clients ever to realize the kind of autonomy at work that their therapists exercise. Therapists must begin to assist their clients to handle working in authoritarian cultures, not deny that their clients have to. We know of a workshop facilitator who conducts child abuse information seminars at corporate workplaces during noon hour. She described to us how employees frequently draw the parallel between their own abuse as children and the abuse that is happening to them at work. The attendees’ report the abusive treatment is supported by the norms of the organization–and they feel nothing can be done about it short of quitting the job. The facilitator feels she has to discourage these discussions of work abuse so that her seminars will not threaten the organizations that have invited her. Alice Miller in her book Banished Knowledge, in the chapter, Pretending to Want to Know, reports that her articles on child abuse have been refused by publishing companies’ top management. She suspects top managers’ hesitation to confront their own abuse as children is the probable reason for not publishing the material. In our experience, it is likely that articles on child abuse activate an unpleasant awareness of abuse that is happening within the publishing industry itself. Our clients who are employed in publishing confirm this view. It’s clear that work abuse keeps child abuse patterns current and alive within parents who work. And the daily abuse of parents who work makes it more likely that the repressed pain of a person’s own childhood will be acted out against his or her children. We agree with Alice Miller that child abuse must be regarded as a criminal offense punishable by law. Additionally, we believe work abuse must be recognized–and stopped–as a major source of the pain that makes parents want to abuse their children and each other. How does therapists’ control over their own work situation affect their denial about work abuse? First, the independence therapists enjoy contributes to therapists being uninformed of how bad the work world is for their clients. We are all hypnotized by our work cultures so that we see our own particular culture as general reality for everyone. It’s the same way that abused kids assume that all kids get mistreated, and rich kids assume that everyone has the privileges they have. Therapists may believe that their clients can “create their own reality” at work, as easily as the therapist can, and that only personal psychological handicaps are holding them back. Secondly, for therapists who do acknowledge the discrepancy between their own work lives and those of their clients, there is often a feeling of helpless guilt. These therapists may have escaped from the same authoritarian work world, or knowingly avoided it by becoming therapists, and feel unable to help their clients cope with it any better than they could. Denial helps them avoid facing this helplessness and their own “survivor guilt.” The denial keeps them from reaching out for solutions that do exist and finding new ways that they can truly help their clients. By the time therapists achieve autonomy and esteem in their practice, they have denied the shame they endured as interns during their training years, and the humiliation of the bureaucratized evaluations they went through in acquiring their licenses. Systematic shaming occurs in most supervision situations, which can be as arbitrary and authoritarian as any workplace, but with a veneer of caring in the language. The intern who breaks the rule by calling the process is seen as “paranoid” or “unable to take supervision.” The person may be told to reenter their own therapy in order to work the issue until they come out the other side (“the other side” is agreeing not to talk about the shame or the power imbalance in supervision). Ironically, this is another version–this time within the counseling community itself–of recommending the identified patient for individual therapy instead of facing the problem in the system. Denial about the shaming of interns sets up the new generation of therapists to deny the power dynamics in their training and to gloss the power dynamics in the therapist-client relationship as well. The final source of therapists’ denial about work abuse comes from the prevailing belief that our role should be restricted to the therapy hour, the treatment of particular clients. It is a hesitation and belief about using our influence to intervene in institutions or become advocates of change in the world outside the clinic. In facing the extent of abuse in the workplace, we are addressing a situation that may seem to push us, as psychotherapists, farther than any previous issue in confronting social and political structures and redefining our role as therapists. We have an opportunity and responsibility before us, and it will require rethinking the presently assumed limitations of our role. Early on when a concept arose in mental health that challenged the existing paradigm of who we are and what we treat, some professionals put up resistance. Doctors resisted Freud originally, making it too personally threatening for him to be honest about his discoveries of his clients’ sexual abuse. Freud felt he couldn’t say the truth because he believed it would have destroyed his credibility. From the historical perspective–as Alice Miller points out–not saying the truth has in fact detracted from Freud’s credibility. Psychotherapists similarly resisted the idea of treating the family system when it originated. But family therapy has succeeded, and much abuse has been prevented by family therapy interventions. Family therapists can be proud of their achievement in successfully confronting pressures to treat only the “identified patient” and insisting instead that they focus on the system. Perhaps the largest part of our resistance to facing the work abuse issue is that it forces us to change our comfortable identity: treating recognized problems in ways we know we can feel competent and at the same time be socially respected. Initially, raising a new issue may seem to threaten our legitimacy and credibility. But in the longer range picture, we can respect ourselves for our efforts, because we are saying the truth. Talking about what happens inside our institutions does take us into territory about which we feel ignorant and over which we seemingly have no control. Psychotherapists are socially recognized as a “cleanup crew” that assists people with problems to reenter the world as given. When we begin to question the world as given, and suggest changes and interventions to assist the functioning of individuals at work, we are no longer limited to being the “cleanup crew.” We are beginning to take a larger responsibility for assisting our client’s mental health. Part of the challenge to therapists’ identity is that many therapists feel they know too little about organizations to help their clients at work. As with any new mental health issue, we have to break through our reluctance to approach this new field of information. We are no more to blame for our initial reluctance than our clients engaging the first steps of change. We can not overlook the seriousness of the reasons for the denial pointed to in this paper. There is no blame for being in denial; it is our learned protection from what threatens us. We can only decide future actions by weighing these reasons against the seriousness of the issue, which demands that we break through the denial if we are to stop abuse from continuing as the rule of thumb in our world. The custom of abusive work is an institutionalized form of self hate. To change it we have to begin to love ourselves, even in facing our denial. We as mental health practitioners are the people best equipped to demonstrate this process. Help us to do this. Thank you.